Cathodic protection is an approach which is employed to control the corrosion that occurs on the surface of the metal by making it the cathode of an electro-chemical cell. This procedure is quite simple which involves the connection of the metal to be protected, to a more easily corroded metal which is usually called the “sacrificial metal” to act as the anode. This sacrificial metal then corrodes instead of the protected metal. 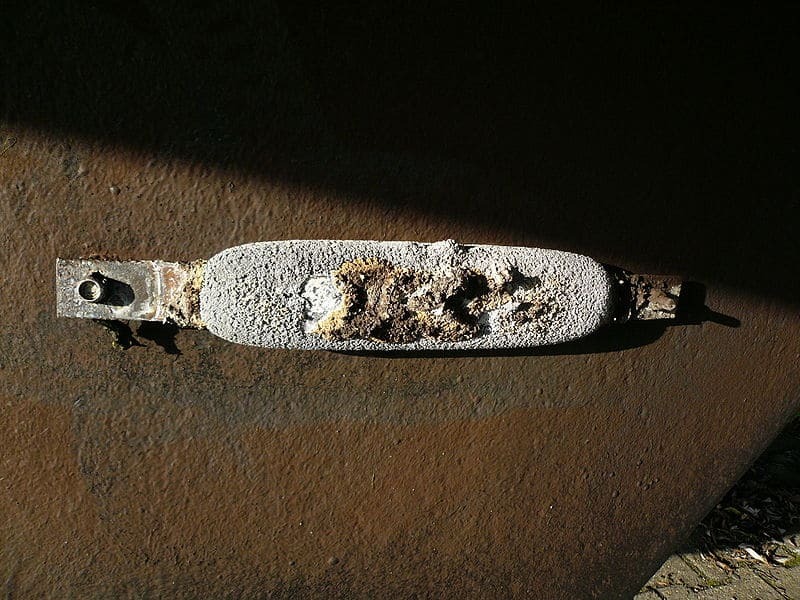 Corrosion is basically defined as the deterioration of materials by chemical processes. Of these, the most important is the electro-chemical corrosion of metals, in which the oxidation process M→ M+ + e- is enabled by the presence of a suitable electron acceptor which is termed as a depolarizer. The corrosion can be understood as the spontaneous return of the metals to their ores, ie the huge amount of energy which was consumed in mining, refining and manufacturing them is dissipated in many different ways. 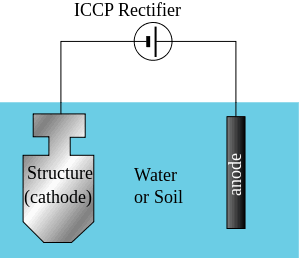 Both cathodic and anodic steps are required for the corrosion to occur. Hence prevention of any one will stop the process of corrosion. The most common solution is to coat the material with paint or any other protective coating. But at places where the coatings are broken, the process may get initiated. The first application of this procedure was made in 1824.Sacrificial anodes which were made from iron, were attached to the copper sheath of the hull (main body of the ship) below the waterline. This drastically reduced the corrosion rate of the copper. 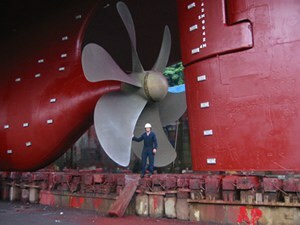 The side effect of this Cathodic protection was to increase the marine growth. When copper corrodes, it releases copper ions which have an anti-fouling effect. Anti-fouling prevents the bio-fouling which is the undesirable growth of marine organisms on immersed structures such as ship hulls, intake pipes etc. When the excess marine growth started affecting the performance of the ship, the Royal Navy decided to allow the copper to corrode and have the benefit of reduced marine growth. Hence the Cathodic protection was not used further, until 1928 where this was applied again to steel gas pipelines in US and was more widely used from 1930s. 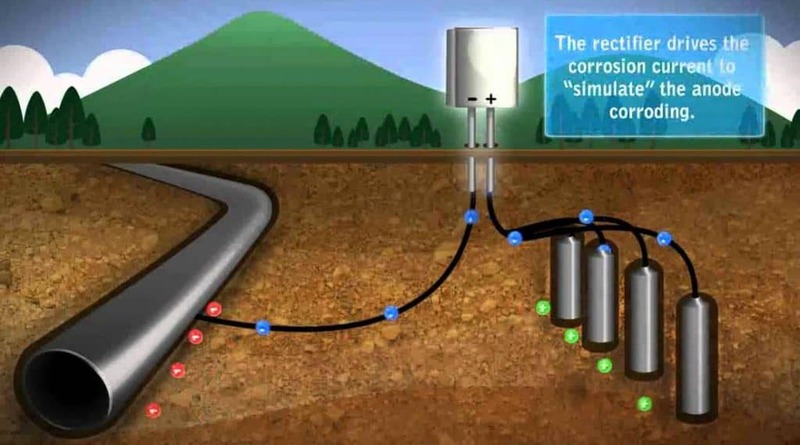 Cathodic protection systems protect almost all kinds of metals in various environments. The most widely used applications are Steel pipelines which contain water or fuel, steel storage tanks, Steel pier piles, offshore oil platforms, onshore oil well casings and metal reinforcement bars in concrete buildings and structures. Another application which is also common is in galvanized steel, in which a sacrificial coating of zinc on steel parts protects them from rust. The stress corrosion cracking can also be prevented by Cathodic protection. In this type, a galvanic anode which is an electrochemically active metal, is attached to the endangered metal surface where it is exposed to an electrolyte. 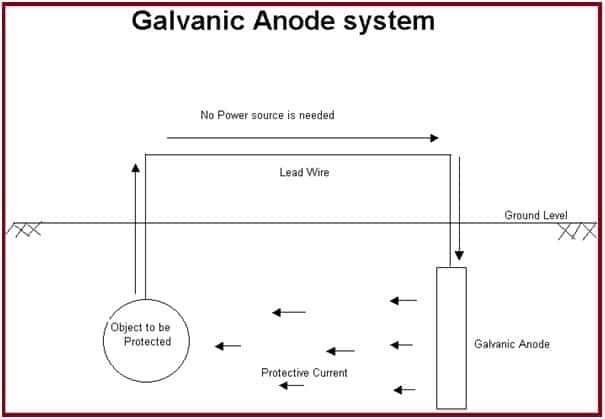 Galvanic anodes are chosen because they have a more active voltage, which means that they have more negative electrode potential than the metal of the target structure (which is generally steel). Galvanic anodes have limited life-spans during which the sacrificial anode will continue to degrade and protect the tank or the piping. The galvanic anode keeps corroding until the anode material is fully consumed and eventually it must be replaced. When galvanic anodes are used for structures that are larger in size and have high electrolyte resistivity, they can’t drive enough current economically to provide protection. In these cases, impressed current Cathodic protection (ICCP) systems are used which have a much longer life span than the galvanic anodes. These systems include a rectifier that converts the AC power source to a DC, which is properly calibrated to provide the required protection. As the power source is delivered to the electrode and is not generated by the degradation of the electrode, the power supply to the electrode may be recalibrated to provide additional power, as and when needed. The application to concrete reinforcement is slightly different. The anodes and the reference electrodes are usually embedded in the concrete at the time of the construction when the concrete is being poured. The usual technique used here is the ICCP system. Pipelines carrying Hazardous products are protected by a coating supplement with Cathodic protection. ICCP systems are used here. It is sometimes more economical to protect the Pipes of smaller diameter and limited length by the galvanic anodes. An air cooled cathodic protection rectifier connected to a pipeline. Cathodic protection is often executed by galvanic anodes attached to the hull of small ships and for large vessels, ICCP systems are used. Marine Cathodic protection covers jetties, harbors, offshore structures. Here structure specific Cathodic protection systems are used depending on the structure geometry, composition and architecture etc. Cathodic protection is used on pipelines, vessels and tanks which carry liquids to protect them from corrosion on their internal surfaces. Galvanic anodes and ICCP systems are used here. Galvanizing is a way of coating steel with a layer of metallic zinc or tin, which acts as a sacrificial anode.